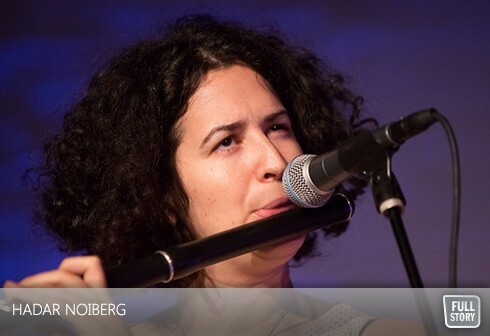 By Leonard Carl--Flutist, composer, and arranger Hadar Noiberg takes listeners on a journey through jazz improvisation, where Middle Eastern and North African rhythms and melodies meet Western harmonic structure. On Thursday, November 22nd, Torontonians will have the unique opportunity to enjoy Hadar’s unique sounds as The Hadar Noiberg Trio will bring the best of Israeli musical culture to the Al Green Theatre at 8:00 p.m., as part of Toronto Downtown Jazz’s commitment to support jazz year round. Tickets are on sale through the Al Green Theatre Box Office, in the Miles Nadal JCC at 750 Spadina Avenue. The concert is co-presented by the Al Green Theatre with generous support from the Canada Israel Cultural Foundation and the Consulate General of Israel. Joined by Edward Perez on double bass and Yoni Halevy on drums, Noiberg leads with the flute, bringing the depth and richness of her heritage to the surface on stage. In the Middle East, the flute is a primal instrument that holds the deep soul of music, and she blends it with Western influences to create an innovative sound that transcends boundaries. Noiberg’s sophomore CD, Journey Back Home, showcases her ability to seamlessly fuse styles and evoke emotion through music. Noiberg’s career began early on; as a young musician, she toured with the Young Philharmonic Orchestra and studied classical music at the Tel Aviv Academy of Music; she is the founding member of celebrated African/Israeli fusion group Yemen Blues. Upon arriving in North America, she enrolled in flute and composition at the City College of New York, under the guidance of acclaimed composer David Del Tredici. In 2007, the ASCAP foundation granted Noiberg an outstanding award for her composition skills. For tickets, call the Al Green Theatre Box Office at 416.924.6211, x0 or visit www.algreentheatre.ca.